A gracious fusion of diving comfort, succulent meals and awesome dive buddies - these equate to a weekend spent with us onboard MV Nautica. The long coach and ferry journey is a thing of the past. There will be no more discomfort of having to carry around heavy luggage and dive gear. After a tiring day of pure fun diving, it shall be a good choice of relaxing inside your cozy cabin or lazing around either at the Sun Deck or the open air dining area. And to top it all, there will be a parade of freshly prepared sumptuous buffet meals to power you up for the adventure filled 3D2N weekend trip onboard MV Nautica. Without a doubt, it is a leisure dive experience to be on every diver’s list. Built in 2004, MV Nautica is 24m long steel hull boat with 3 decks. She has 2 engines and a cruising speed of 8 - 10 knots. There are both fresh water tank and water maker on board. Electricity runs on voltage 220V and 380V with 2 50KW generators on stand by. Meal times onboard MV Nautica are surely part of the highlights of the trip with the sumptuous dishes being served at the open air dining area. Two sizable dining tables, four surrounding benches and few stools are casually assembled in the area. 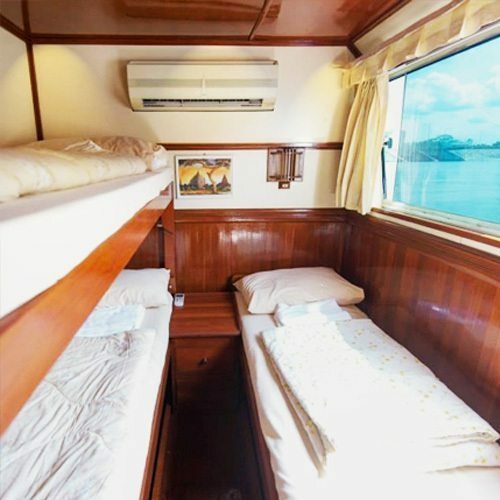 This appropriately serves as the gathering area for meals, as well as boat and dive briefings and other leisure activities after dive such as movie watching and game playing. The Sundeck at the bow area proffers a fitting space to enjoy the sea breeze while having a break from diving. During the day, sunbathing presents a good option while stargazing at night equally sounds ideal. Particularly worthy to note is the Mattress Area which is situated directly behind the Dining Area. The 20-square meter space provides an excellent venue to relax after a dive, enjoy a good read or have a listen from the good selection of CDs/DVDs. 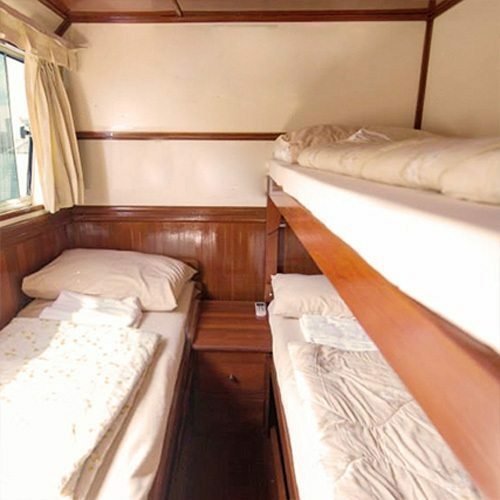 MV Nautica has a roomy dive platform which can accommodate 16 divers. Scuba tank holders are conveniently spread on both sides to secure them in place. There are 2 freshwater showers and separate bathroom. A storage space for dive gear, wetsuit dry racks, rinse tank for underwater camera and 2 exit ladders complete the diving facility requisites. A 4.5-meter Dinghy brings out our group of divers on the chosen dive sites. It is powered of a 40Hp Yamaha Outboard and designed to meet the demands of each and every trip. A delectable variation of Western and Asian cuisine comprise our meals served buffet style onboard MV Nautica. Our chef, with his extensive experience preparing dishes for international guests, most assuredly cater to our divers significant requirements: delicious, healthy and filling food feast.